Christmas is the magical time of the year and the best way to celebrate it is by spinning the reels of this slot machine so you can earn huge rewards so you can buy all what you want for yourself and your loved ones. The game gives players the ability to enjoy the Christmas spirit which is filled with warmth, love and gifts. 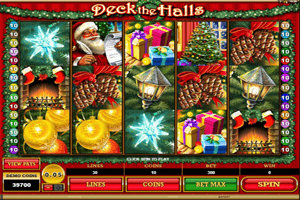 Once players open the slot machine, they will notice that the red color of Christmas dominates the interface and on the reels, players will see many Christmas themed symbols. These symbols land on the game’s 5 reels and thirty winning lines. They include Christmas presents, a lantern, Santa Clause, a reindeer, a Christmas tree, Christmas decorations, a Thanksgiving turkey and the logo of the game among other symbols. Since the game is brought to players from the portfolio of Microgaming, they can expect plenty of special symbols. This includes a wild symbol which is represented by the logo of the game icon. It will substitute for other symbols to help players get paid. There is also the golden bells symbol which is the scatter icon that can trigger free spins. Santa also appears in the form of stacked wilds during free spins.